“You’ve surely heard that broccoli is one of nature’s most potent cancer-preventing foods. Several studies attest to this fact. One of the reasons that broccoli seems to work is related to a compound called sulforaphane. It selectively targets cancer stem cells, and by doing so, it effectively prevents the cancer from spreading and/or recurring…. “Let’s talk about sulfurophane. First, why can’t they use easy words like “dog” or “cat” for those healthy compounds! Let’s call ’em “sulfy.” Are you with me…sulfy. Sulfy helps 200 of your genes, including the ones that make you younger. Sulfy allows YOU to make your own antioxidants, too. A big secret is that the antioxidants your body makes are far more powerful than the ones you eat! In other words, YOU are more powerful than a bowl of blueberries! But that’s only true if you give yourself the raw ingredients. Broccoli: yum! LOL! If you like broccoli, then you are definitely a step ahead. I don’t hate broccoli, but I don’t eat enough of it according to Dr. Mercola, who wants you and me to eat 10 spears of it a week. Ten spears?!? Place the broccoli in a saucepan with a small amount of water; cover and cook until crisp-tender. Meanwhile, combine remaining ingredients. 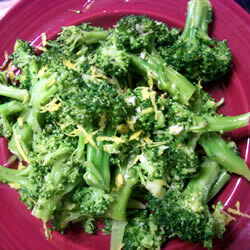 Drain broccoli and place in a serving dish; add lemon mixture and toss to coat. Serve immediately.